William Shakespeare’s stage play about an ambitious Scottish general who, emboldened by a prophesy related to him by some witches in a forest and further encouraged by his conniving wife, embarks on a bloody rampage to assume the throne, has survived countless adaptations over the centuries. Orson Welles brought the story to the screen in 1948, as did Roman Polanski in 1971. The latest cinematic version from local director Geoffrey Wright transposes the action from 11th Century Scotland to contemporary Melbourne, complete with nightclubs and logging trucks. 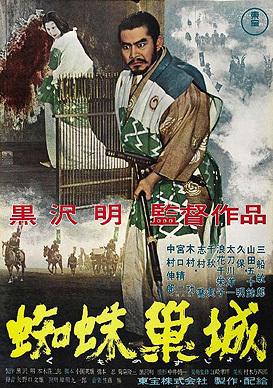 But it’s Akira Kurosawa’s 1957 version, that still holds a favoured place in many film buff’s catalogues. Shot amongst the swirling fogs and volcanic soils of Mount Fuji, Kumonosu Jo or Throne of Blood is about as creepy an interpretation of the Bard’s famous work as they come. Foregoing the iambic pentameter in preference for visual poetry, the film starts with a desolate chant about Spider’s Web Castle (a “castle of delusion” that substitutes for Dunsinane). We are transported back in time to a medieval Japanese landscape and introduced us to a wild-eyed samurai warrior called Washizu (Toshiro Mifune). He and his loyal friend Miki (Minoru Chiaki) are galloping back and forth through the mists of Spider’s Web Forest, lost it would seem, until confronted by a luminous white spirit figure spinning an endless silken thread. This otherwise motionless old woman stops short of saying ‘bubble, bubble, toil and trouble..’ but she does predict a tantalising fate for Washizu. Her mask-like face is reflected in that of Lady Asaji Washizu (Isuzu Yamada) who takes the old lady’s words to heart where they soon fester into blood-soaked action. Using the traditions of Noh theatre to create an eerie, other-worldliness about the tale, Kurosawa builds the drama to its inevitable scene of carnage with Washizu transforming from warlord to human echidna under a rain of his own army’s arrows. The legendary director was to tackle Shakespeare again in his films The Bad Sleep Well and Ran – his takes on ‘Hamlet’ and ‘King Lear’ respectively – all stories of epic emotional proportions where the space between God-like royalty and basic every day humanity becomes indiscernibly small.